You don't have to be an elf to appreciate this fine piece! Exquisitely fashioned of brass and steel. Raise your collection to an entirely new level! Take home this finely crafted High Elven Warrior Display Sword. 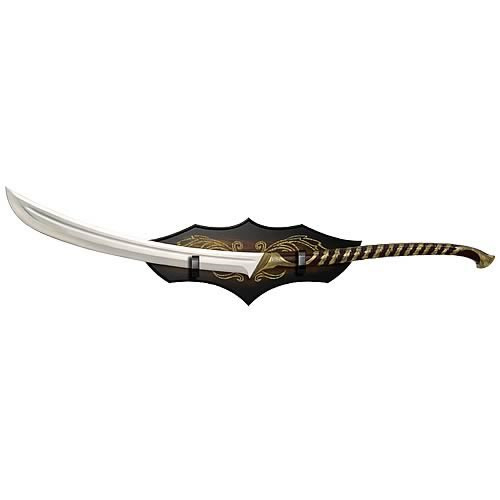 As seen in the Lord of the Rings trilogy, this artistically elegant weapon features solid-metal handle parts, simulated-leather grip, and a brass-plated vine design. The sword measures 49 3/4-inch long, with the blade measuring 24 1/8-inches. The blade is 420-grade, false-edged stainless steel and comes with a decorative wooden display plaque and certificate of authenticity. This magnificent creation will raise your collection to an entirely new level!